One of the earliest stars in the Habsburg firmament was Maximilian I. An exhibition in his honour at the Prunksaal of Vienna’s National Library includes some rather beautiful literary artifacts from his time. Emperor Maximilian I died 500 years ago in 1519. Which is a good enough reason to hold an exhibition about his life and works. And, frankly, he was no ordinary Habsburg monarch. First, he was the one who really set the family on the way to European stardom, thanks in part to his clever marriage strategy. Second, he was a particularly capable fellow, both adept at the physical pursuits of the aristocracy and a learned scholar and author. Tip: Maximilian’s interests in knightly activities are best discovered in a neighbouring building; the Imperial Armoury features a lot of exquisite arms and armour from his time. The exhibition sits inside the truly magnificent Prunksaal (state hall) of the national library, where a set of information displays tackle themes within Maximilian’s life and times. Examples include his love of hunting, his marriages, his education, and the mythology and propaganda built up around his rule. The displays also cover such broader topics as astrology, music, and geography. A selection of written works from the library’s collection illustrates each section. “Written works” sounds rather uninspiring until you realise just how rare, precious, and even beautiful some of these works are. You are in for an absolute treat if you have even a passing interest in old books and manuscripts. It was a time when books were not mere words, but works of art and prestige; the precision and details in some of the illuminations are quite breathtaking. The gorgeous decorative calligraphy in such works as Eleonore of Portugal’s 1464 prayer book or the statute book of the Order of the Golden Fleece. The earliest known print of the famous Livre de la Chasse hunting manual. 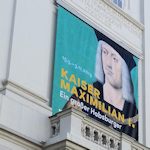 The Maximilian exhibition runs from March 15, 2019 to November 3, 2019. It requires no special ticket, just the normal entrance ticket for the Prunksaal (same opening times, too) or use of a Vienna Pass (see my review). Follow the instructions for reaching the Prunksaal/state hall.